Survivor South Pacific: What’s Wrong With Cochran?! I haven’t really been posting on this season of Survivor. But, after last night’s episode, I had to. I need a little vent session. What is wrong with Cochran? This is the question of the week. Actually, I have been asking this question in the back of my mind since the beginning of the season. But last night, it pushed me over the edge. 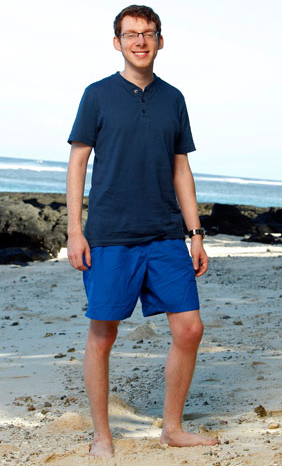 This guy comes off like he’s so super intelligent and knows the game of Survivor like he created it or something. The he pulls stupid crap like he did last night, landing him on Redemption Island with Ozzy. Yeah, he’s smooth. I have an idea, you want to stay in the game and earn your spot? Win a freaking competition for the love of Pete. You personality isn’t winning you any points! I know that all of the Survivor contestants get pretty dirty out there. They have no soap, shower, etc. BUT, they all use the ocean to help maintain. All of the except Cochran! He’s so dang dirty! His nose is always covered in dirt, his clothes, his scary, pasty body. Ewww! Drives me nuts! Then of course when he was watching Coach in the shower last night, he had the creepiest look on his face. What was that?! When I watch Cochran getting his massage, all I could of was how bad it must have been for the girl doing it. She rubbed Cochran’s nasty arse! Ahhh! I would have died! Do you think that Prince Albert gave the prize to Cochran because he was so sick of having to smell him since he never bathes? I know, I know. He was going for jury points. But wow. I would have! I loved the end with Ozzy telling Cochran he has a chance of beating him in the duel. Then telling the camera he has no chance. That was classic! I will be so glad to see Cochran gone next week! Scarlett Johansson Filled With Jealous RAGE? !